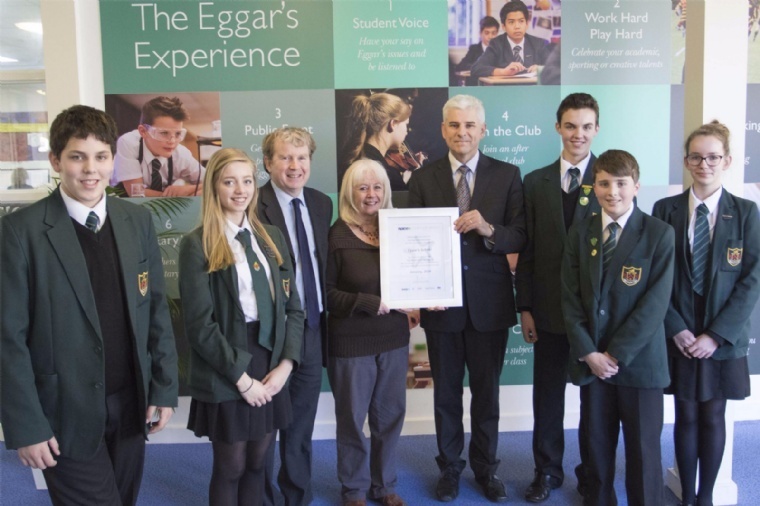 Eggar’s School is only the third secondary school in Hampshire to achieve this prestigious award. The Award is given for high quality work by the whole school in challenging all students to achieve their best. NACE, the National Association for Able Children in Education, is a leading national education organisation and charity. Assessors for the award were impressed by the strong leadership and management of provision which keeps the needs of more able learners at the forefront of the school’s work. They judged quality by observing lessons, interviewing students, teachers, parents and governors, and by looking at students’ work. The accreditation was made on the basis of the high quality and commitment they saw across the school. Patrick Sullivan, Head Teacher, summed up by saying “We are very proud of our inclusivity and achievements in the school, and the introduction of the Eggar’s Experience this year has further developed the philosophy that every child at Eggar’s is able and talented. Our most able students, who have extremely high aspirations, are given the best opportunities to challenge themselves and reach for the top. We believe in developing the ‘whole’ student and they flourish under the guidance of outstanding teaching on a day to day basis. As ever, it was a full team effort and further recognition of the excellent provision in and beyond the classroom at Eggar’s School!